The sound of the harmonica is produced by beathing air across the reeds inside. The longest reeds make the lowest notes, while the shortest reeds make the highest notes. 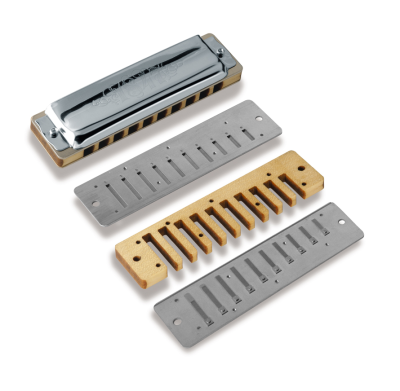 A 10 hole diatonic harmonica (pictured) has 10 blow reeds and 10 draw reeds. 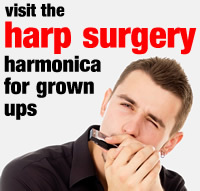 Other types of harmonica have more or fewer reeds. Some have two reeds for each note. Inside a harmonica, the reeds are attached to reed-plates. You can see two reed plates in the picture. The top one is for the blow reeds. The bottom one is for the draw reeds. The reed plates are attached to a middle section called a comb. You can see a wooden comb in the picture. Harmonicas combs can be made from different materials such as pear wood, bamboo, metal and plastic. To protect the reeds, two cover-plates complete our tin sandwich, one on top and one underneath. This where you will find the name of the harmonica and often a capital letter to tell you which key the hramonica plays in. We usually start learning with the key of C.